Why do bats fly at night? 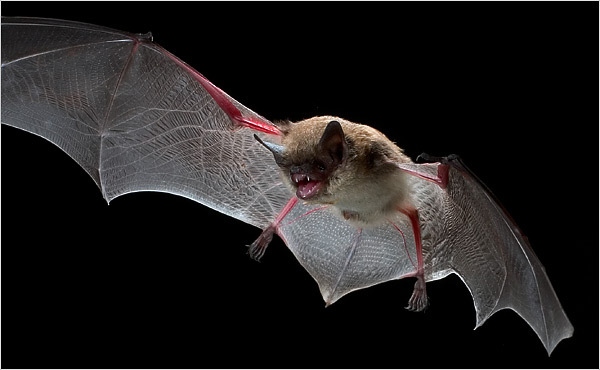 Some birds and many animals, including bats, are adapted for living mostly at night. Why are some animals more active at certain times of the night or day? The answer to this question is usually found in the kind of food the animal likes to eat. Most bats are insect eaters. During the day, bats sleep hanging from the ceilings of caves or buildings. At sunset the bats leave their daytime shelter for a nighttime of hunting insects, which they catch while flying. Bats have a built-in “radar system” that enables them to chase insects through thick forests on the darkest night without bumping into anything. While flying, a bat makes a twittering sound that is so high-pitched that a human cannot hear it.